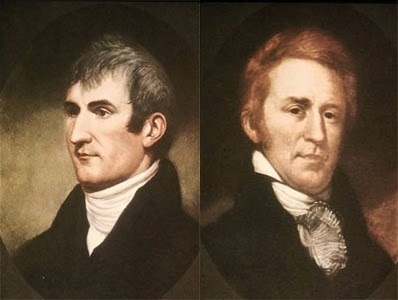 On this on day in 1804, Meriwether Lewis and William Clark set off from Missouri on an adventure of a lifetime. Officially titled the “Corps of Discovery,” the group was commissioned by President Thomas Jefferson to explore the Louisiana Purchase. This enormous parcel of land contained more than 828,000 square miles and makes up much of the modern American Midwest. However, the expedition (and Jefferson for that matter) had larger aims. Lewis and Clark were to locate the best and most practical water route to the Pacific Ocean, make contact with native tribes, and observe and record natural resources. First they needed a guide. They found an able one in Sacajawea, the Native American wife of a French fur trapper. With her help and their own efforts, the expedition managed to accomplish nearly all of their goals. They made contacts with many Native American peoples and made copious and detailed journal entries on land masses and native fauna. Their greatest achievement was reaching the Pacific Ocean, albeit not entirely by water way as Jefferson asked, on November 15, 1805. Lewis and Clark’s impact is still felt today. They named countless rivers and land formations, gave the American government and its people of sense of the worth of the land they had purchased, and helped kick start the American Western Expansion. It is also a story of diversity that in a way reflects modern America. The expedition’s members included people of both Native American and French cultures, Americans from all over the early states, and a slave named York who participated as a full member of the team and afterward probably escaped to freedom. They taught us about curiosity and the drive to explore the unknown. By the time Lewis and Clark finished the round trip back to St. Louis, Missouri, they had endured harsh climates, terrible weather, dangerous river rapids, and occasional hostilities from Native Americans. Not everyone in the Corps made it back. The fact that a group of less than forty men, one woman, and a dog managed to accomplish the near impossible tasks set before them is extraordinary.